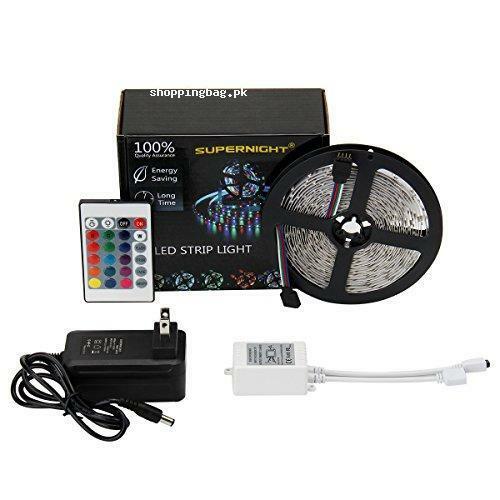 SUPERNIGHT Remote Control LED Lighting Kit has the competent red green blue LED light strip and a remote control. 300 programmed LEDs are embedded on adhesive tape so you can paste it on any wall or thing for decoration. Energy efficient, super bright LED flexible lighting strip. You can set the lighting on any of 4 different modes such as flash mode, strobe mode, fade mode and smooth mode. You can also adjust the brightness of the lights and frequency of colors via the remote control. It gets the power supply of 12V 2A. The length of LED strip is 5 M and you can trim the strip as per your need so you can decorate your room for birthday party, entrance gate, or gallery easily. It is eco-friendly product which you buy from the collection of Amazon imported products in Pakistan at reasonable price. Get the best SUPERNIGHT Remote Control LED Lighting Kit price in Pakistan and place your order now. You will get the Amazon products in Pakistan at your front door with the fluent payment option of cash on delivery. Ornament your room with the flashing lights and have the delightful experience of Amazon online shopping in Pakistan.